The Bay Area is the latest community to indulge in ping pong pandemonium as SPiN, the original ping pong social club founded in New York City by Academy Award-winning actress Susan Sarandon, heads to San Francisco. SPiN will open its doors in the SoMa neighborhood of San Francisco on May 19th, in the trendy and recently renovated building at 690 Folsom Street. Embodying SPiN’s eclectic yet accessible mix of high-energy social play and experiential entertainment, the new San Francisco location boasts two bars, a full-service kitchen, and 19 ping pong tables including patio-pong and private rooms. The ping pong social club that has exploded as a global brand will continue its journey as a catalyst to inspire connections and shared experiences with the residents of the City by the Bay. Surrounded by the distinctive SPiN atmosphere that fuses energy and playfulness with comfort, the venue offers a wide range of activities for guests, including tournament leagues, casual social play, and private ping pong lessons. Ping pong fanatics can get a more heightened experience with SPiN’s annual memberships, which feature exclusive perks, table reservations, access to members-only events, and more, to create an experience unlike anything San Francisco has seen. SPiN is the ultimate destination and arts-and-entertainment oasis, offering a variety of sensational programming that includes everything from dance battles to live street art and themed events. The corporate leagues, ongoing Grudge Matches, and The League tournaments encourage guests to connect while the “Dirty Dozen” tournament – SPiN’s signature live art and interactive performance experience – allows ping pong pros and aspiring amateurs to battle it out for prizes and ultimate bragging rights. For guests looking for a challenge, private lessons are offered from ping pong “pros,” such as seven-time US World Olympics team member Barney Reed. SPiN has fostered a creative and cool community that celebrity guests such as Justin Bieber, Drake, and Jimmy Fallon have adopted while remaining an approachable and inclusive destination. 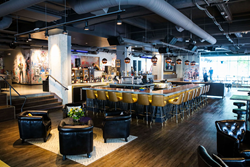 Providing an enticing environment for the ultimate in social play, the space is designed by Eaton Hall Architecture, and features Olympic sports flooring at Center Court, 19 state-of-the-art STIGA ping pong tables, two full bars, private lounge area, and patio. The design features decorative lighting including LED rope lights and custom ping pong light fixtures above each table. Custom millwork pieces including leather banquette seating add charm to the space while large wood barn doors close off the private room playing area. The House DJ will be able to spin the latest and hottest music while MC’s will conduct guest ping pong centric games and competitions. Creating an atmosphere that pays homage to San Francisco’s lively cityscape, art installation murals from local graffiti artists PEMEX and RPES are incorporated throughout the venue, infusing it with the vibrant influences of the city. Additional works and art installations from noted artists David Flores, Stikki Peaches, TiU and OBEY Founder Shepard Fairey are featured, adding colorful allure and vibrant energy to the interior. Led by the renowned Chef Mike Betancourt, SPiN will continue its culinary commitment to ethical eating practices. Using locally-sourced ingredients whenever possible, the city of San Francisco will have a distinct influence on the food menu. Classics such as steamed bun sliders and seasonal flatbreads will be served alongside favorites including guacamole, wings and truffle fries. The San Francisco location will also debut an Irish coffee ice-cream sandwich. SPiN believes in the bottom line – especially with the planet and people in mind. Confident that ping pong can make a positive impact on youth, SPiN is dedicated to supporting underprivileged youth living in urban centers. By providing a connection through the game of ping pong, urban youth are given a chance to escape into a fun, constructive and challenging sport. In San Francisco, SPiN has teamed up with The Glide Foundation, an organization whose mission is to create a radically inclusive, just, and loving community mobilized to alleviate suffering and break the cycles of poverty and marginalization. Additionally, STIGA, in partnership with SPiN, will generously make table donations on an annual basis to organizations and inner-city schools. SPiN has developed programs in 68 underserved schools in New York in partnership with AYTTO, and plans to do the same in San Francisco. SPiN is committed to making a big footprint in the lives of others, not on the planet, and are proud that their venues are completely carbon neutral. SPiN is proud to partner with WeWork, Stiga, White Girl Rose, Surf Air, APL Footwear, and Outdoor Voices on the San Francisco opening. APL Footwear and Outdoor Voices will be outfitting staff with gear equipped with the utmost in comfort to keep up with their active daily routines. Surf Air will provide convenient flights for celebrity guests from Los Angeles to the opening in San Francisco. Residents can also look forward to events, tournaments, and classes taught by SPiN “Pros” at WeWork locations and at SPiN following the opening. SPiN is open from 11AM – 12AM on Sunday and Monday, 11AM – 1AM on Tuesday and Wednesday and from 11AM - 2AM on Thursday, Friday and Saturday. For additional information, visit WeAreSPiN.com and follow the conversation #wearespin on social media. STIGA® table tennis tables and equipment are sold in over 100 countries worldwide and used by the world's leading table tennis players. STIGA products are known for innovation, style, design and playability. STIGA ... Play The Best. SPiN is a network of international ping pong social clubs that combine a unique mixture of sport, design and entertainment meant to inspire connections and shared experiences. Offering experiences from both day to night, the clubs feature engaging atmospheres such as ping pong courts, a full bar, restaurant and private VIP room. Memberships are available but are not necessary to reserve a ping pong table, take part in the nightly events, tournaments, private ping pong instruction with professional players, and casual socializing and play. Venues are currently located in San Francisco, New York, Chicago, Los Angeles and Toronto. For more information, please visit: http://www.wearespin.com #wearespin.